Yes, You Can Run Windows and Office on Chromebooks! Business users are Microsoft’s bread and butter; they rely on Windows and Microsoft Office. The Windows-based Office suite cannot be installed on Chromebooks, but who cares? All you really need is the use of MS Office, and you can get that from Microsoft Office 365, the cloud service. Up to five members of a household can use the Home Premium version of Office 365 for $9.99 per month. But there's also a completely free version of Microsoft Office, called Office Online, which provides web-based access to Word, Excel and PowerPoint. Read about Office Online in my article Free Microsoft Office Online? to find out how it compares to the paid Office 365, and a similar free offering, Google Docs. Here's another alternative that brings a full-fledged Windows desktop experience to your Chromebook. The Chrome Remote Desktop app will let you tap a Windows computer and run any software residing on it. Your Chromebook basically acts as a dumb terminal, displaying the remote computer’s screen and transmitting your commands to it. I’ve written about other web-based remote desktop access services that serve this purpose just as well as Chrome Remote Desktop. First, you’ll need to install Crouton to create a Linux desktop alongside your Chrome OS system. You can then install Wine in the Linux environment and use it to install and run native Windows apps. The good geeks at HowToGeek.com have very nice tutorials on these subjects. See Install Linux with Crouton on Chromebook and Install Wine on Linux and run Windows apps. Business users generally seek the reassurance of a well-known, established business to support their IT needs. VMWare’s Horizon Desktop-as-a-Service solution fits that bill, and now the company is providing business Chromebook users with software and services to bring Windows apps to Chromebooks just as the open-source Crouton and Wine programs do for home users. 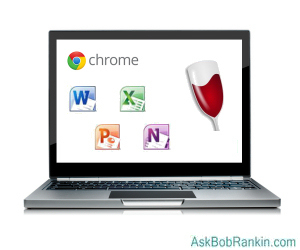 Bottom line, there ARE ways to run Windows and Office apps on your Chromebook. More and more software is becoming web-based, which means you don't have to install it or worry about updates. It also means that your operating system (Windows, Mac OS, Linux or Chrome OS) doesn't matter as much. That's a positive trend for users. Most recent comments on "Windows Apps on a Chromebook?" Question is- does Google want people to run Windows apps on their Chromebooks? EDITOR'S NOTE: That would only be a win for Google, right? Wine isn't so easy to use. "That would only be a win for Google.."
What about Virtual machines like Virtual Box and VM ware, would they work on Linux for Chrome?